Colin was the reserve team goalkeeper who deputised for senior goalkeeper John Cooke. He was signed by Mossley in 1971 from Ashton United to whom he later returned and played for them on three different occasions. He also spent three spells at Hyde United. Later coached local youth football team Medlock Rangers. Previously with Bolton Wanderers, Leeds United reserves, Wigan Athletic, Horwich RMI, Altrincham, Morecambe, Bury and Chorley Fred signed from Witton Albion. He was a prolific goal scorer, schemer, diligent and hardworking player. Fred played his part in the wonderful FA Cup run in his sole season with the club which culminated in the well documented tie against Fulham. Finding the travelling from his home in Chorley difficult, Fred elected to re-sign for Chorley in May 1968. He was employed as a lecturer by the Education Authority in Chorley and taught PE to boys in the evenings. First played for Bedford Street School (Crewe) and Willaston White Star before signing for Crewe Alexandra (October 1937), Wolverhampton Wanderers in May 1938 where he made just one senior appearance, Bournemouth in May 1939 (41 league appearances) and Carlisle United in November 1948 (39 league appearances). Also played in Stockport County WW2 team. Signed for Macclesfield in the summer of 1949. In his first five appearances for the Silkmen at inside-right he scored four goals including two on his debut. He was then moved to left-half, with his last appearance for the club on 1 October 1950 in the FA Cup Preliminary Round against Congleton Town. After this match he was released at his own request. Jack had spent 12 months at Manchester United before moving to Kirkby Town and Wigan Athletic. He was then captain at Netherfield in the 1976-77 season, and after short spells at Southport and Lancaster City moved to Macclesfield in February 1978 from South Liverpool, to whom he returned at the end of the season. His one goal for the Silkmen came against Wigan Athletic on 4 March 1978. By trade he was a commercial artist. Came to the Moss Rose having previously played for Wigan Athletic Reserves. His only senior appearance came in a 2-0 defeat. Initially on the books of Everton and Bury, Mark, a tremendous tackler, was signed from Witton Albion. He went on to play for Marine, Prescot Cables and Southport. An employee counsellor at BT. Signed from Nantwich having previously been on the books of Bolton Wanderers, most of his appearances came at outside-left, although in a season of many positional changes, he also feature occasionally at centre-forward and outside-right. A speedy player with a good shot he regularly appeared on the score sheet, probably his best performance coming in the 4-0 home victory against Manchester North End in November 1927 when he scored two goals. From Manchester, he was one of a significant number of players given a trial during the 1919-20 season. At some stage was on the books of Manchester City and later played for Hurst and from 1920 to 1922 for Mossley where he made 27 appearances and scored 13 goals. Featured in the opening two matches of the season but was replaced by the highly thought of Lappin, however, Taylor became a member of the Macclesfield reserve team. One of several players given a trial in Macclesfield's first season following the Second World War. Although he scored in the 2-0 home win against Congleton Town in the first round of the Challenge Cup, he did not feature again. Joined Macclesfield in December 1975 having managed Buxton for a spell, becoming joint manager of the reserves with John Barnes. Spent a few weeks in October and November 1976 as caretaker manager of the senior side following the resignation of John Barnes. Initially played for Bedford FC (South East Lancashire League) before signing for Rochdale as an amateur in January 1935, turning professional in August 1935. As a member of Macclesfield's reserve team in 1935-36 he made three senior appearances as a defender. Fred graduated to the senior side for the 1936-37 season featuring at outside-left on a fairly regular basis but he had to share the position with Dunkerley. On leaving the Macclesfield he moved to Hurst (summer of 1937), Stalybridge Celtic (August 1938) and finally Bacup. Joined Ferranti's FC in the summer of 1923, then moving to Hurst (summer 1923) and Oldham Athletic (December 1923). Signed for Macclesfield in August 1929, was always known as 'Happy' by both his fellow players and the supporters, George completed his sole season at the Moss Rose as joint top-scorer with Billy Johnston scoring three hat-tricks, two of which came in the Cheshire Senior Cup competition in which he gained a winners' medal. On leaving Macclesfield he returned to Hurst in the summer of 1930 and signed for Newport County in September 1933 returning to Hurst May 1934. A trainee at Chelsea, Rhys featured in the youth and reserve teams as well as an unused substitute for Premier League matches. During his time at Chelsea he spent time on loan firstly as cover at Queens Park Rangers, then Crewe Alexandra for the 2010-11 season when he made 49 appearances in all competitions and in 2012 at Rotherham United where he appeared in 20 league matches. After his release by Chelsea he was signed by Preston North End in January 2013 but was released without making a senior appearance. Rhys was signed by Macclesfield Town on transfer deadline day in January 2013 to take the place of the injured Lance Cronin. Other than for one match when he was serving a suspension, Rhys was ever-present to the end of the season making some impressive performances. He continued as the Silkmen's first-choice 'keeper through the 2013-14 season when he was almost ever-present, only missing one league and two major cup matches. Signed non-contract forms for the first half of the 2014-15 season enabling him to keep his options open but wanting to play regular first team football signed a permanent contract for the second half of the season. Rhys was again the first choice 'keeper for the 2014-15 season making more appearances (48) than any other player. Enjoyed another excellent season keeping 18 clean sheets, saving penalties and making some important and, at times, spectacular saves. His 100th appearance in all competitions for the Silkmen came on 24 January 2015 in the home match against Lincoln City and he was voted joint Players' Player of the Year alongside George Pilkington. Offered a new contract by Macclesfield in the summer of 2015, Rhys opted to sign for Football League club Newport County where he failed to establish himself in the team spending time on loan at Wrexham. Signed for AFC Fylde in the summer of 2016 and moved on loan to Tranmere Rovers in January 2018 until the end of the 2017-18 season. Returned to Macclesfield Town in July 2018 signing a one-year deal. Rhys has also won International caps for Wales at U17, U19 and U21 levels. Moved to Macclesfield from Lancaster. During his three seasons with Macclesfield Taylor appeared regularly and only missed matches when he was unfit including when he was recovering from a broken cheek bone in the 1908-09 season. He enjoyed a successful time with the Silkmen gaining a winners' medal in the Cheshire Senior Cup in the 1910-11 and he was a member of the team which won the Manchester League Championship in 1908-09 and 1910-11. Andrew was still a trainee playing in the reserve and youth sides when he made his senior debut at a time when the Silkmen’s defence was decimated by injury. At the beginning of the 2005-06 season Andrew was awarded his first professional contract, but had to wait until November to make his first appearance of the season for the senior side, after which he featured regularly in the starting line-up. Andrew rarely gave a below-par performance, whether he played in his more accustomed role on the right of a three-man central defence, or at right-back in a four-man line, looked comfortable on the ball and distributed accurately. Featuring regularly again at the start of the 2006-07 season in the centre of the defence, he was unfortunate to break a leg in a collision with Jonny Brain in the match at Stockport County in November 2006 which left him side-lined for the remainder of the season. After months of rehab, including learning how to run again, Andrew regained full fitness during the 2007-08 season, but with no opportunities for him at the Moss Rose, he spent some time on loan at Tamworth and Hyde United and was released in the summer of 2008. Signed for Leigh Genesis in July 2008 moving to Lancaster City in January 2009 where he became club captain. 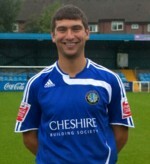 Andrew moved to Chorley at the end of the January 2011 transfer window where he is captain. He led his side to the Championship of the Evo-Stik NPL Premier League in the 2013-14 season and was the BetBright Step 3 & 4 Player of the Year. In 2018 as part of the 50th Anniversary celebrations of the formation of the Northern Premier League (now the Evo-Stik League) a vote was held to find the top 100 NPL players in which Andrew came a very respectable fourth. Billy started his career in the youth set up at Tranmere Rovers but made his Football League debut after his transfer to Manchester City (1975). He then moved to Peterborough United (1975-76), Colchester on loan (1976) and having been unable to establish himself at any of these clubs signed for Runcorn. 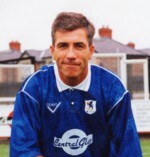 He then went on to play for Crewe Alexandra, Bangor City, Oswestry Town and Worcester City. Next stop was Macclesfield, and whilst he was not a regular member of the side, he had a useful strike rate of a goal almost every four matches. He signed off with a goal in each of the last two matches of the season against King’s Lynn and Grantham. On leaving the Silkmen at the end of the 1981-82 season he signed for Northwich Victoria. At the start of his career played for West Kirby Central, Heswell FC and Hoylake before signing for Tranmere Rovers (August 1931), then returned to Hoylake (March 1933), New Brighton (July 1935), Tranmere Rovers again (September 1936) and Northwich Victoria. Progressed through the Academy at Barnsley, he had impressed with their Under 18s and Under 21s teams before breaking into the first team during the 2015-16 season. Joined Macclesfield Town on loan towards the end of March 2016 until the end of the season. Made just one appearance as a 77th minute substitute replacing Danny Rowe on the left wing in home match against Braintree Town on 2 April 2016. Returned to Barnsley at the end of his loan. Given further loan spells from Barnsley at Gainsborough Trinity from October 2016 and North Ferriby United from January 2017. Released by Barnsley in the summer of 2017 signed for Shaw Lane in July 2017 but quickly moved to Ossett Town in September 2017 and then Worksop Town in November 2017, signing on dual registration for Matlock Town in January 2018, moving to Harworth Colliery in March 2019. An experienced left-back, Andrejus had appeared for Skonto Riga in the Champions League qualifying rounds at the start of the season before joining the Silkmen on a non-contract basis for a taste of English football. Injury and administrative problems over his work permit, meant that he was ineligible for selection for competitive games until the middle of February 2001 when he made his Football League debut replacing the injured Chris Priest in the 39th minute in the match against Hartlepool United, when he was asked to play in a wide-left midfield position in which he was clearly uncomfortable. At the time it was difficult to understand why he was used in this position when his career had been based on a left-back role, especially when another experienced midfielder was on the bench in Steve Wood, however, in a post-match comment Gil Prescott said that they thought the team would benefit from the height of Andrejus. He was indeed a tall and powerfully built defender who, when he was with Macclesfield, had represented Lithuania for over a decade and held the record for the number of caps for his country at that time. An article in a matchday programme by Andy Fraser mentioned that after leaving Macclesfield Andrejus had found it difficult to settle permanently at another club in Europe, eventually putting his CV on the internet. Has since been on the books of FK Zalgiris (twice) and FC Almaty. Before joining Macclesfield Frank was captain of Endon Rovers in the Leek and Moorlands League, after which he moved to the North Staffs Church League and then to Badderley Green where was again captain. In 1934 he moved to Stoke, signing for Macclesfield in the summer of 1935. During his three seasons with the club he was the senior team 'keeper and rarely missed more than one match at a time through injury. However, in March 1937 he was dropped to the reserves following four straight defeats, but was re-instated for the final match of the season and retained his position for the 1937-38 season. With Stoke reserves in the 1920-21 season, he played in a pre-season practice match for Macclesfield. With Harry Pearson out injured at the start of the season Thomas featured in his place in the opening match. Whether Thomas remained with the club for the remainder of the season is unknown as there is no record of him playing for the reserves, however, he was signed by Stafford Rangers for the 1922-23 season. Liverpool born Adam joined Stoke City from Everton where he played twice for their Under 21 side. During the 2014-15 season he was in his third year with the Potters' Under 21 side and had made 35 appearances for Stoke at that level. Signed on loan for Macclesfield at the end of August 2014 until the end of December 2014. With few opportunities available to him, Adam only made three substitute appearances and was an unused substitute on eight occasions during his time at Macclesfield, returning to Stoke at the end of December 2014. Having been released by Stoke City joined Hednesford Town in 2015 and moved to Stockport County in the summer of 2016. An amateur who was signed in December 1955 at the age of 19, when he was undertaking his National Service in the RAF and stationed at Wilmslow. Prior to joining the RAF he played in Welsh soccer. His goal came in the 3-2 victory against Crewe Alexandra in the first round of the Cheshire Senior Cup. Danny is a former Leicester City trainee where he made three Premier League appearances from the substitutes’ bench. He then spent two years at AFC Bournemouth followed by a move to Boston United in March 2004 where he made almost 100 appearances in all competitions. In the 2006-07 season he signed short term contracts at both Shrewsbury Town and Hereford United but only played a limited number times. The lively wing-man, wanting to resurrect his career, turned down an offer from Hereford United and was one of Paul Ince’s last signings in the summer of 2007 when he made the move to Macclesfield Town. In the 2007-08 season Danny was almost ever-present and made more appearances than any of his colleagues. Very much an attacking out-and-out left winger who used his extraordinary pace to good effect, and was not afraid to cut into the centre of the pitch when surging forward. He scored four goals, two of which were winning strikes. In the 2008-09 season Danny continued to use his pace, but with a different formation using only two or three in the midfield, opportunities for his wide play were restricted and he was often substituted when in the starting line-up or came on form the bench. Danny was released at the end of the season. Has since played for Kettering and Tamworth. He signed for Icelandic Club FH in May 2012 where he gained a Championship winners' medal and played in two rounds of the Europa League. Danny retired from playing football in January 2013 to work for an estate agency company. Michael has progressed through the ranks at the Moss Rose and was given his first professional contract in the summer of 2010. Equally capable of playing in defence or in the midfield, where he has played for both the reserve and the senior sides. Wanting to play regularly, Michael spent time on loan at Mossley in the 2010-11 season and at the beginning of the 2011-12 season he spent three months on loan at Leek Town. On returning to the Moss Rose there were few opportunities for Michael, whose two starts came at Accrington at the beginning of January and in the home match against Plymouth at the end of February. Released in the summer of 2012 at the end of his contract he signed for Colwyn Bay in the summer of 2012 moving to Leek Town in October 2012. Joined Northwich Victoria in August 2013 leaving them in August 2015 when he played for Linotype Cheadle Heath Nomads for a short time before signing for Mossley in September 2015. Left Mossley in April 2016 to work in the Netherlands but returned to re-join them in November 2017 but also featured for Winsford United from December 2017 (possible dual registration). Before moving to Macclesfield had played for Nottingham Forest, Rochdale (1910), Nelson (1911), Rochdale again (1912), Hurst during the 1912-13 season and back to Rochdale for a third time during the 1912-13 season. Initially played in the Macclesfield reserve team with his senior appearances, in three different positions, all coming in the final weeks of the 1919-20 season at a time when the club were clearing a backlog of matches especially in the Subsidiary Competition and in a season when almost 70 different players featured. All his appearances came within a month at the end of the season. It was reported that he was not afraid of having a shot at goal, proof of which came when he scored two goals in the home match against Stalybridge Celtic, however, unfortunately he found himself on the losing side. Prior to joining Macclesfield Town Milan was with Manchester United and Manchester City, joining the Silkmen's former Centre of Excellence under 14 side progressing to first year apprentice in the youth team. Milan's strongest position is at centre forward but he can also play in all mid-field positions. He makes good use of his electric pace, is a good passer of the ball and displays an excellent work rate. Given an opportunity at senior level as a second half substitute in a Thursday evening Cheshire Senior Cup match in the 2013-14 season when senior players were being rested. Milan signed a professional contract at the start of the 2014-15 season but only made two appearances in the Cheshire Senior Cup Competition. Would appear to have been released by Macclesfield during the 2014-15 season as he was registered as a player for the now defunct Stockport Sports FC. Enjoyed a wonderful debut when he was provider for the first goal and scored the winner in the 2-1 victory, but only made one further appearance in the next match in the first round home defeat against Congleton Town in the Challenge Cup. Started his career with the Manchester City Academy signing for Salford City in October 2014. Moved to Macclesfield Town in February 2015 signing non-contract forms but only made one appearance in the Cheshire Senior Cup competition. Joined the Academy at Nottingham Forest in 2016 and has played in their Development team. Made his senior professional debut against Millwall in the EFL Cup in August 2016. Re-joined Macclesfield on loan in February 2017 but few opportunities came his way. His three starts in the 2016-17 season were all at the end of the season at a time when manager John Askey was resting players whilst completing a backlog of fixtures. Having been released by Nottingham Forest at the end of the 2016-17 season signed for Hartlepool United but was released at the end of December 2017. Since then has played for Egerton. In his school days Jesse represented Bolton Schoolboys. At senior level he played for Stalybridge Celtic and Lancaster Town before signing for Macclesfield in the summer of 1934. His first matches for the Silkmen came when he deputised for his elder brother, Thomas, earning praise as a worthy deputy. However, his first two seasons saw him as a bit-part player, but he secured a regular place in the team for the 1936-37 season when he was almost ever-present at right-back. Following a handful of early appearances in the 1938-39 season he moved to Droylsden. The elder brother of Jesse, who, as schoolboy, represented Bolton in inter-town matches. On leaving school he signed for Lancaster Town before playing for Crewe Alexandra (August 1927), and Stalybridge Celtic (summer 1928) where he was captain and remained there until his move to Macclesfield. Signed for Macclesfield in the summer of 1934, he was the team's vice-captain and played in the majority of matches as a reliable defender with a powerful kick, giving little away, a good tackler and always calm under pressure. Along the way he gained several honours: four schoolboy medals, Lancashire Junior Cup winners' medal, Lancashire Combination Championship medal and a Cheshire Senior Cup winners' medal with Macclesfield in 1935. By trade he was a cotton operative and enjoyed playing tennis. In the context of the day it was worthy reporting that he was a non-smoker. With Norman Gillott sustaining a pre-season injury, Thornton, a member of the reserve team, filled in for the opening match of the season. A member of the 8th Cheshire Rifle Volunteers team who featured in the first season of the newly formed Macclesfield FC team. Said to be a capable defender, he was the older brother of Sammy Thorp. Another player who started his football career as a member of the 8th Cheshire Rifle Volunteer team and became a member of the newly formed Macclesfield FC side. Younger brother of JWH Thorp who was a student at Oxford University whilst playing for the 8th Cheshire Rifle Volunteers team. He also featured in the newly formed Macclesfield FC team for two seasons. In his book, John Earles recalls that Sammy delighted the crowd with a splendid exposition of dribbling the ball and forward play such as was in vogue in those early days of football. Andy was an experienced Football League player having made over 550 appearances in two spells for Stockport County and 62 appearances for Tranmere Rovers. He then spent time in Australia playing for Morwell Falcons in Victoria returning home to sign for Witton Albion. Andy came to the Moss Rose from Witton Albion on an extended loan as cover for players injured or suspended. Previously with Oldham Athletic and Bolton Wanderers, Sean was signed as an apprentice for the Macclesfield youth team in the summer of 2013. A versatile player who is capable of playing at right back, as a forward or on either wing, he is competitive, has plenty of pace and delivers good corners. Given an opportunity at senior level in a Cheshire Senior Cup match played on a Thursday evening in the 2013-14 season when some of the senior players were being rested. In the 2014-15 season Sean made two appearances in the Cheshire Senior Cup competition and was an unused substitute in the final of the competition when Macclesfield won the cup. With Avro Football Club for the 2016-17 season. Having started his career at Manchester City, John played at Hyde United under Peter Wragg before moving to Altrincham (fee £3,000). He signed for the Silkmen in a player exchange deal and a fee of £6,000 with Altrincham where he had been top scorer in the 1986-87 season. Initially John did not make the starting line-up on a regular basis, but his pace and goal scoring ability ensured that he soon became a regular member of the match-day team. During his latter days with the Silkmen, John dropped back from the forward line to the midfield. He gained a runners’ up medal in the 1989 FA Trophy at Wembley, was voted Player of the Year for the 1992-93 season and gained representative honours with NPL XI and FA XI. On leaving Macclesfield he signed for Witton Albion. Having retired from playing football John is a professional gambler. Darren joined Northwich Victoria in December 1993 from Colwyn Bay moving to the Moss Rose in February 1996 for a fee of £10,000 which turned out to be a bargain. He was one of the most respected defenders in the Conference for his tough tackling and good heading ability. Being cup-tied, Darren had to sit out the Silkmen’s victorious FA Trophy Final at Wembley in 1996 against Northwich Victoria, but the following season he was an important part of the Conference Championship winning side, also gaining a winners' medal in the Staffordshire Senior Cup in 1998. Darren slotted into league football with ease, initially playing at right-back with a strong presence, a good turn of speed and was excellent on the overlap especially with John Askey on the right wing. He was a member of the Nationwide League Division 3 side in 1997-98 which completed the season as runners-up gaining promotion to Division 2. Also gained a winners' medal in the Cheshire Senior Cup in 1998. The 1999-2000 season was a notable one for Darren when in October he was appointed captain in place of Gregor Rioch and, on 27th November 1999, he became the first Silkman to reach 100 Football League appearances in the match against Hartlepool United, an achievement which was recognised with a special presentation by Silk FM, and in the last match of that season he scored his first-ever league goal. From the 2000-01 season Darren was used in his preferred position in the centre of defence where he was a commanding figure, and there were many times when his long throw-ins were used to good effect. This was possibly his best season and was acknowledged by the fans when Darren was voted Player of the Year. Even today Darren holds the Macclesfield Town record for the most number of appearances in all competitions since the Silkmen were promoted to the Football League, with every single one of his appearances coming from the starting line-up and none from the substitutes’ bench, recognising his overall ability. After sterling service to the club David Moss released Darren in the summer of 2003, shortly after which he signed for Shrewsbury Town. Since then he has played for Burton Albion, Altrincham, Nantwich Town where he was the joint manager and finally played for Leek Town until 2012. Darren is a qualified chartered physiotherapist with his own practice and is a NHS physio at RJAH Orthopaedic Hospital. Moving through the ranks at Oldham, Matthew gained his first professional contract in 1997 making well over 100 appearances for them, and earned six Under-21 caps for Wales, having previously represented his country at youth level. Matthew moved to the Moss Rose in February 2002 and although he had a slow start, his pace caused problems for defenders. Matthew soon started to notch up various achievements - in the 2002-03 season he was joint top-scorer with 14 goals and the following season, after a health scare, he hit a rich vein of form completing the season as the side’s top-scorer with 19 goals and was voted Player of the Year. He notched up another 14 goals in the 2004-05 season, including his sole hat-trick for the club in the 3–0 win against Rochdale, and was appointed captain on the departure of Tommy Widdrington. He left Macclesfield in the summer of 2005, signing for Mansfield Town but quickly moved to Bury. However, at the start of the 2006-07 season he did not feature in the manager’s plans and spent almost the whole season on loan with the Silkmen, where he was used to support the regular strikers giving pace to the attack and a contrasting style to other players. In the summer of 2007 Matthew was released by Bury and shortly after signed for Hyde United and then spent time at Droylsden. Matthew signed for the Silkmen for a third time in the summer of 2009. He found himself well down the pecking order, with most of his appearances coming from the substitutes’ bench. He scored five goals, including three from the penalty spot (three other spot kicks were all missed at a time when he was not on the field of play). Despite showing that he could cause problems in the box Matthew was released in the summer of 2010. He then signed for Dundalk and has since played for Portadown, Linfield and Ballymena United. Having been released by Ballymena on 24 March 2016, Matthew immediately announced his retirement from playing football. He joined Irish Championship side Warrenpoint Town as assistant manager in the summer of 2016 and when long serving Manager and Director of Football Barry Gray stepped down from his managerial position, Matthew was appointed senior team manager in November 2016 winning promotion to the Irish Premiership in his first season as manager. With his contract at Warrenpoint cancelled by mutual consent Matthew was appointed manager at Portadown at the end of February 2018. Albert commenced his career at Leek Alexandra before moving to West Bromwich Albion Reserves in 1933. He the signed for Port Vale during the 1934-35 season making four senior league appearances. Signed for Macclesfield in May 1935, described as a speedy and enthusiastic player, Albert only missed one league match throughout the whole of the 1935-36 season when he scored his fair share of goals. Died 17 September 1986 in Stoke on Trent. Graham was a tall, strong, skilful and very highly rated central defender who gave over a decade of service to Macclesfield. He was recruited from Altrincham where he won an APL Champions medal. Such was his standing in the eyes of the supporters, he was voted Player of the Year for the 1983-84 and 1990-91 seasons. He was also club captain, a member of the triple winning squad in 1986-87 (NPL Championship, League Cup and Presidents Cup), gained winners' medals in the Cheshire Senior Cup in 1983 and 1991, and was a regular member of the NPL XI squad and FA XI. Graham was selected for the England semi-pro team but unfortunately suffered an injury which kept him out of the team. 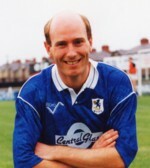 On leaving Macclesfield moved to Nantwich Town early in the 1991-92 season after which he retired from playing football. Whilst at Macclesfield Graham was a teacher at a special needs school. Remains a teacher taking PE and coaches youngsters. Steve won a FA Youth Cup winners’ medal whilst with Leeds but he joined the Silkmen from Witton Albion who had signed him from Stockport County. He was a small, fast, tricky midfield player who spent time out on loan at Hyde United and Winsford United before moving to Flixton in the summer of 1996. 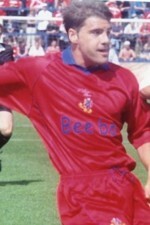 Whilst at Macclesfield he gained a Staffordshire Senior Cup winners' medal in 1994 and was a member of the Conference Championship side in the 1994-95 season. He signed for Leek Town in November 1996 and later played for Hyde United, Kidsgrove Athletic, Skelmersdale United, Mossley, Flixton (again), Salford City and Prescot Cables. In 1999 Jamie was the youngest player ever to line up in a senior game for Shrewsbury Town when he was just 16 years and 193 days old, coming on as a substitute against Oxford United in the second round of the FA Cup. Having progressed through the club’s youth ranks he was awarded his first professional contract in January 2001 at the age of 17, and went on to make over 180 appearances as a hard tackling central midfielder. He also made 12 appearances for the Welsh under-21 side. Having been released by Shrewsbury, Jamie moved to the Moss Rose in August 2006 and featured regularly in the first half of the season in a central midfield position, but appeared to lose his place when John Miles was called into the side to provide a more attacking option. Towards the end of the season Jamie suffered a shoulder injury which kept him out of contention for a time, however, when selected, he always battled hard and used his physical ability well, with his one goal in the 2006-07 season coming from a spectacular 30-yard free-kick. Jamie missed the start of the 2007-08 season after surgery on ruptured tendons in his wrist, but having fully recovered became a regular in the starting line-up in the second half of that season. Jamie turned down a contract offer in the summer of 2008, and was released but changed his mind and re-signed for the club at the end of July 2008 after an unsuccessful trial at Luton. Jamie found himself as rather a bit part player in the 2008-09 season and was released in the summer of 2009 when he signed for Hereford United. He then moved to Wrexham in 2010, Mansfield Town in 2012, Kidderminster Harriers in 2013 and then Colwyn Bay in January 2014 but having been released by them became a free agent. He signed for Welsh Premier League side Newtown in January 2016 but left them at the end of the 2015-16 season. Initially with Wolverhampton Wanderers reserve team and then with Stoke in November 1914. Served in the Army during WW1 returning to Stoke in November 1919. Then signed for Aberdare Athletic (July 1920) making 46 appearances in all competitions scoring four goals, Rochdale (June 1923) making 168 appearances in all competitions scoring 45 goals, Stockport County (May 1928) 82 appearances in all competitions and 27 goals and Connah's Quay & Shotton (August 1930). Signed by Macclesfield in December 1920 he went straight into the senior side making his first appearance with fellow debutant Harold Peters. Other than for four matches, two of which he had to make way for trialists, he was ever-present to the end of the season. His goals were spread throughout his short time at Macclesfield, scoring a brace on two occasions, against Runcorn and Chester. He signed for Rossendale United in the summer of 1932. Derek joined Port Vale as an amateur in 1949 but never made a senior appearance for them and moved to Burton Albion in 1951, He returned to Port Vale in December 1952 when he signed as a professional, going onto make 29 league appearances scoring five goals and featured in their 1953-54 title winning campaign. On leaving the Valiants he joined Crewe Alexandra early in the 1955-56 season. Signing for Macclesfield in the summer of 1958, Derek could play in either half-back position, but usually featured at right-half in his first two seasons, however, for most of the 1960-61 season he filled the right-back position. Having established himself in the side during his first season, he went on to be almost ever present in the following two seasons. He was a member of the side which won the Cheshire Senior Cup in April 1960. 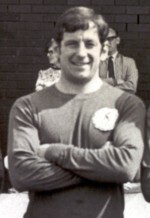 On leaving Macclesfield he moved to Altrincham where he appeared in 39 games during the 1961-62 season. Ben was a member of Rotherham's youth system but joined Worksop Town of the Evo Stick Premier League at the age of 17 and was given his first contract in December 2008. The striker remained at Worksop until signing for the Silkmen in the summer of 2011. In the 2009-10 season he finished as Worksop's top scorer with 13 goals in all competitions and notched up an impressive 29 goals in the 2010-11 season. His first match for Macclesfield was his Football League debut, and in his eighth appearance scored the club's fastest ever goal in 6.7 seconds in the home match against Morecambe in September 2011. Ben was playing well and had scored five goals, including two in the 90th minute in the 4-0 win at Hereford United, when he was injured at Crewe Alexandra in October resulting in a long lay-off. He returned for the first match of 2012 but incurred a thigh injury which kept him out of contention until the middle February. Between his return and the end of the season he was ill, and of his eleven appearances, he only played the full 90 minutes twice. Nevertheless, in a low scoring season, he finished as second top-scorer with six goals. Ben moved to Alfreton Town for an undisclosed fee in the summer of 2012. Signed for Lincoln City in the summer of 2013 joining up again with manager Gary Simpson. Having been released by Lincoln in the summer of 2015, Ben signed a two year contract with new Football League side Barnet but spent time on loan at Grimsby Town, Tranmere Rovers and Barrow. Left Barnet at the end of January 2017 when his contract was cancelled by mutual consent and signed non-contract forms with Carlisle in March 2017 where he only made two appearances. Joined AFC Halifax Town in the summer of 2017. Dave's career started at Sheffield Wednesday, after which he moved to Rotherham United, York City, Gainsborough Trinity and Boston United before signing for Barnet (fee £20,000). It was during his time at Barnet that he spent a month on loan at Macclesfield when he played with pace and demonstrated an ability to read the game well. On leaving Barnet he signed for Peterborough United followed by Kettering Town, Dagenham & Redbridge, Witton Albion, Stalybridge Celtic and Buxton. Bradford City signed Graeme initially on schoolboy forms and then as an apprentice, making his senior debut at the age of 17 in a FA Cup tie, with his Football League debut coming at the age of 18 when he scored against Cambridge United. Good scoring form, as well as a good performance against Manchester United in a Youth Cup tie, prompted a transfer to Old Trafford for a fee of £100,000. Having made a handful of appearances for Manchester United and loan spells with three clubs, he moved to Macclesfield in the summer of 1998. Whilst with the Silkmen he showed good awareness around the box, close control and ability to get round defenders finishing as top-scorer with eight goals in a season where the team’s overall strike rate was miserable. His most notable performance came in the second round of the FA Cup in December 1998, when he scored a second half hat-trick in eleven minutes against Cambridge United. In his second season he struggled to win a regular place and was mostly used from the substitutes’ bench. In 2000 Graeme gained a winners' medal in the Cheshire Senior Cup. With the lack of opportunities for him at Macclesfield, Graeme moved to Exeter City in the summer of 2000, and to Stevenage Borough two years later. Having been released by Stevenage Borough he has played for several non-League clubs, the last being Dunstable Town leaving them at the end of the 2004-05 season when he probably retired from playing football. Came from Oldham and played for Oldham Athletic in the Lancashire Combination B Division in the 1904-05 season and then moved to Denton and then Atherton from where he signed for Macclesfield in November 1908. Basically a member of Macclesfield's reserve team who was used more often than many other reserve team players to deputise for senior players who were unavailable for league matches. He played his part scoring at rate of one goal every two appearances including a hat-trick in the 5-1 win at Buxton in October 1909. Played for United Glassblowers at youth level before signing for Horwich RMI at senior level. He then moved to Manchester United in 1932 where he made 12 league appearances before signing for Barnsley in 1935 where he made 14 league appearances. Moved to Macclesfield for the 1936-37 season, Harry initially played as a defender but on Boxing Day 1936 moved to the centre-forward position and scored in the 2-0 home win against Stalybridge Celtic. Following his transfer to the forward line he made 12 consecutive appearances, scoring the majority of his goals in this period, including five in the 10-1 home win against Hyde United. He was then absent for a month, but returned early in April and scored a hat-trick in the final match of the season in the 3-3 draw at Rhyl. Harry was released by Macclesfield in the summer of 1937 after which he featured for Manchester North End and Wigan Athletic. Away from football he was a Sports Outfitter. He died in January 1977 at the age of 68. A French national, Gime has played for Brest B (2012-13), Viry Chatillon (2013-14), La Roche-sur-Yon (2015-16) and Fontenay LCVF (2016-17) in the French Championnat National 2, Group D (regional fourth division). Looking for a career in England in the summer of 2017, he first had a trial at Wrexham but opted to sign for Macclesfield where most of his appearances came in August and September with two additional appearances from the substitutes' bench in October. With a goal drought he was unable to force his way into the team and at the end of January 2018 his contract was cancelled by mutual consent. It would appear that he was unattached on leaving Macclesfield until he signed a short term contract with an option to extend at AFC Fylde on 30 July 2018. Left AFC Fylde in December 2018 signing for Sutton United at a time when the AFC Fylde manager questioned Toure's commitment. Previously on the books at Stockport County he signed for Macclesfield in the summer of 1925. He was the first choice 'keeper from the start of the season to November 1925 when the reserve team 'keeper H Bossons replaced him, however, he remained the second string 'keeper deputising for Bossons on three subsequent occasions. Kevin, a former England youth international, was released from Everton juniors in the summer of 2000 signing his first professional contract at Rochdale. Out of favour there in the 2004-05 season he moved to the Moss Rose on loan in March 2005 to provide cover for established forwards, and signed permanently for the club in the summer of 2006. He found it difficult to break into the side at a time when Brian Horton preferred to use tall strikers, with the result that most of Kevin’s appearances came from the substitutes’ bench. Nevertheless, when called upon he looked lively and scored four goals, including one in the victory at Nottingham Forest in the first round of the Carling Cup. Having been released at the end of the 2005-06 season Kevin moved to Northwich Victoria and in January 2007 to Welsh Premier League side TNS and in 2008 to Droylsden. Later played for Melbourne Knights where he won the Bill Fleming Media Player of the Year award. Later returned to the UK playing for AFC Fylde moving to Prescott Cables in August 2011, signing for Bootle in 2013 and briefly appeared for AFC Liverpool in late November 2016. Now a coach with North West coaching business 8BY8. Although a trainee at Sheffield United, where he gained his first professional contract in 1997, he made no senior appearances for them, moving to Rotherham United in 1998 and a year later to Carlisle United. However, after two years, a change of management saw Richard looking for a new club signing for the Silkmen in January 2001. Richard featured on the left side of midfield where he displayed a good work rate, and had a dream start scoring with his first touch on his debut, but injuries left him side-lined for several matches only returning in March to give some steady performances. In his second season, Richard appeared fairly regularly in the opening weeks and scored twice in the exciting 4-3 home win against Scunthorpe, but he was later dropped from the starting line-up and in March 2002 his contract was cancelled by mutual consent. Since leaving Macclesfield Richard has played for Scarborough, Bradford Park Avenue, Ossett, Frickley Athletic, Belper Town, Stockbridge Park Steels, Bradford Park Avenue (again) and Ossett Albion. Richard is now a full-time PE teacher. Played as a youth for Port Vale graduating to the senior side in 1964 making 12 league appearances for the Valiants. Given a free transfer, he signed for Macclesfield making his debut in January 1966. Whilst he was described as a utility player, the majority of his appearances at the Moss Rose came as a right-back with the odd appearance on the wing. There is no information whether he continued his career as a footballer but occasionally he played cricket at County level making his debut for Staffordshire in 1963 in the Minor Counties Championship and played a single List A match against Essex in the Gillette Cup in 1976. A former member of Manchester City reserves, Steve signed non-contract forms just before the FA Trophy tie. His single senior appearance came at a time when Mike Brennan and Terry Jukes were both suspended. Signed in December 1957 on a month's trial having previously played for Kidderminster Harriers (he was top scorer with 20 goals in the 1951-52 season), Shrewsbury, Wellington (where he was again a prolific scorer), and Stafford Rangers. Described as a bustling type of player with a strong shot, he only made five appearances with his one goal coming in the 4-1 home win against Runcorn. On leaving the Silkmen he signed for Congleton Town. A former Tranmere Rovers trainee, Carl was awarded his first professional contract there in April 2004 but only made 58 appearances for the club over almost four years. He joined Wrexham in January 2008, where he made 10 appearances in the 2007-08 season. After Wrexham were relegated to the Blue Square Premier League, he rejected offers from League Two clubs Chester City and Rotherham United in favour of remaining at Wrexham in the hope of helping them to return to League football. He played 17 times for Wrexham either side of a short loan at Darlington which was cut short because of their administration. A loan spell at Weymouth ended before the 2008-09 season finished with Carl signing for the Silkmen in the summer of 2009. Carl covered the left-back position with vigour and determination. Ever-present until a hernia operation in January and subsequent problems left him side-lined until the final three matches of the season other than for one match in March when he tried to make an unsuccessful return. Fully recovered for the 2010-11 season Carl, who is known as ‘Tommy’ to his team mates, returned with his enthusiastic and dynamic style of play but with a hip problem which required surgery, he was out of contention from November 2010 to March 2011. The 2011-12 season again saw Carl playing as an attacking left-back always looking for the opportunity to press forward, only missing a few matches through injury. He scored his first goals for the Silkmen in the FA Cup competition in the first round at East Thurrock and in the second round replay against Chelmsford at the Moss Rose. With a year left on his contract at Macclesfield, Carl signed a season-long loan with Floriana FC, Malta in the summer of 2012. Released by Macclesfield at the end of the 2012-13 season when he signed for Inverness Caledonian Thistle. A member of the Macclesfield reserve team who had previously been on the books of Crewe Alexandra, given a one match trial at a time when a number of players were being tried out at left-back. Initially with Downings Tileries, Donald was signed from Port Vale to boost a weakened forward line which had been hit by injury. His goals helped the Silkmen reach the final of the Cheshire Senior Cup against Northwich Victoria when he received a runners-up medal. Donald only remained with the club for 12 months, his last appearance was in January 1951. He moved to Buxton and then Biggleswade Town and Leek Town. Died: Stoke-on-Trent in July 2002. Signed for Macclesfield in August 1935, initially replacing George Rigby when he moved to a defensive position in September 1935, however, later in the season Austin often found himself in competition with George which restricted the number of his appearances. On leaving Macclesfield signed for Bacup Borough in June 1936. Died 29 August 1993 in Bury. Initially played for Whaley Bridge in the Stockport and District league. Trueman spent two separate seasons at Macclesfield. A brilliant winger, he was the first choice outside-right from his debut to the end of the 1907-08 season, only missing four matches through illness, leaving Macclesfield at the end of the season. Signed for Derby County in May 1908 and moved to Sutton Town in May 1910. He was re-signed by Macclesfield for the 1911-12 season appearing fairly regularly for the Manchester League team in the first half of the season and then towards the end of the season, and also featured in the Lancashire Combination team on three occasions at centre-forward in mid-season. On leaving Macclesfield for a second time he returned to Sutton Town in July 1912, moved to Congleton Town in March 1913 and Hyde in November 1914. Paul came though the ranks at Stockport County making almost 150 appearances for them between April 2005 and the end of the 2010-11 season, also spent a short time on loan at Altrincham in March/April 2008. Signed for Northampton Town in the summer of 2011 remaining there until the end of the 2012-13 season and whilst there spent time on loan at Stockport County (twice) and Lincoln City. Paul moved to the Moss Rose during the summer of 2013 but could not make his debut until August Bank Holiday Monday due to injury. Macclesfield's captain leads his team by example as a very competitive and able player who never gives up, working hard from the start to the finish of every match for which he was rewarded on four occasions when he was Man of the Match. Captain again for the 2014-15 season, Paul continued to perform strongly and as an excellent set-piece player missing a few matches when he suffered a back problem and then in the early part of 2015 a calf injury. His five goals were all scored in the first half of the season and included two splendidly taken free kicks at Southport and at home against Nuneaton Town. In the 2015-16 season the Macclesfield captain missed several matches through injury but still put in some good performances in the centre of midfield. However, this was not his best season at the club, but it has to be taken into account that he had to manage a long-term medical issue. Although given the opportunity of renewing his contract with Macclesfield elected to sign for Barrow in the summer of 2016 and then moved to Chester in the summer of 2017. As part of the ongoing reduction in the number of playing staff, Chester FC announced on 8 March 2018 that Paul had left the club by mutual consent later in the day re-signing for Stockport County. Originally with Chilton Colliery RA and then signed for Middlesbrough Reserves, Stockport County (summer 1928), Eden CW and Ashton National. In the immediate years before signing for Macclesfield his career path is uncertain. Appeared on the scene at Macclesfield in December 1937. In the 1937-38 season until December 1937 the right-back position had been filled by seven different players. Cecil then held the position until March 1938 when, due to loss of form, he was replaced by Tom Molloy. Cecil appeared in all three of the Cheshire Cup matches that season. Signed for Stafford Rangers in October 1938. An outstanding amateur with international honours, John joined Macclesfield from Matlock in the middle of the 1971-72 season. He was previously with Skelmersdale where he was captain of their Amateur Cup winning team. A very stylish player who was a key-man in the back four gaining a Cheshire Senior Cup winners' medal in 1973. John was a member of the Middlesex Wanderers tour of Japan towards the end of the 1972-1973 season, flying out after playing in the first match in the longest final in the Cheshire Senior Cup which was only settled after a third replay when the Silkmen triumphed. On returning from Japan, John found out that the final had not been completed and as such was able to collect his winners medal. Worked as a solicitor in Manchester. A member of the Macclesfield Community Sports Trust Football Education & Training Academy who had represented Cheshire at County level. 17 year-old Liam featured from the substitutes' bench in the first round of the Cheshire Senior Cup. He can play on the right of midfield or as a striker, has quick feet and a fantastic turn of pace coupled with an eye for goal. For the 2016-1017 season played for re-formed Manchester Central in the Manchester Football League, Division One (Tier 2) which is managed by former Macclesfield Youth Team manager Paul McGuire. Would appear to have signed dual registration forms in March 2017 when he also appeared for Glossop North End. Signed permanently for Glossop North End in the summer of 2017 and signed for Maine Road FC on dual registration in January 2018. 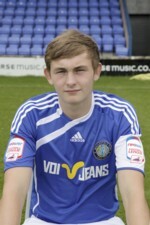 Has also represented Cheshire County Under-21 side. Spend his youth career at Preston North End and then Lancaster City signing for Stockport as an 18-year-old from Myerscough College in 2013 where he had scored 63 goals in the previous season. Having scored six goals in 17 appearances for Stockport Rhys moved to Oldham Athletic for an undisclosed fee in January 2014. Unfortunately, at the start of the 2014-15 season he suffered several hamstring injuries and even on his return he again suffered another injury. Then spent just over two months on loan at York City from September to November 2015. Having made a total of 25 appearances and scored three goals for Oldham, was signed on a short term loan by Macclesfield in January 2016. Used a backup, all but one of his appearances came from the substitutes' bench, the most important in the second round of the FA Trophy at Truro City where he scored Macclesfield's second goal, the match ending in a 2-2 draw. Having sustained an ankle injury, Rhys only managed a further three appearances in the first half of February returning to Oldham at the end of his loan. Signed a two-year contract with Morecambe in the summer of 2016 but moved on loan to Stockport County in January 2018 until the end of the 2017-18 season when he was released by Morecambe after which he signed for Barrow in the summer of 2018. A product of Macclesfield Grammar School Old Boys who was described as a big, strong resolute defender. However, he does not appear to have featured as a regular member of the side in either season. A capable cricketer who played for Bollington and Macclesfield and was a member of the Cheshire County cricket team. Chester played for Macclesfield Modern School and Macclesfield Juniors who were members of the Macclesfield and District League. He then moved to Bramhall in the Lancashire and Cheshire Amateur League remaining there until the outbreak of World War One. In August 1914 he enlisted with the 7th Cheshires as a private obtaining a commission in the Machine Gun Corps in October 1916. Chester was posted to France at the end of 1916 but within a month was invalided home suffering from gas poisoning. After treatment he returned to France where he remained until the end of the War. He was then posted to Cologne in Germany until he was demobilised in 1919. Whilst in the Army he was at Luton for a short time making 12 appearances. At Macclesfield in the 1919-20 season he gradually established himself as a clever and versatile player to the extent that he was a member of the team which won the Altrincham Cup and thereby gained a winners' medal. He started the 1920-21 season with Macclesfield but was released in November1920 so that he could initially join Northwich Victoria (November 1920) and then Congleton Town (December 1920) where he gained a winners' medal in the Cheshire Senior Cup. Signed for Stoke in December 1921 initially as an amateur signing professional forms in January 1922. He returned to Macclesfield at the beginning of the 1922-23 season only missing matches when he was rested because of the effect of an injury incurred in the summer playing cricket. In following seasons he was not always the first choice and missed many matches, although he was reported have been a great favourite of the supporters, however, he was almost ever-present in 1926-27 when he was captain. Gained a winners' medal in the Cheshire League Challenge Cup on 2 May 1925 when Macclesfield were victorious over Manchester North End 4-2 after extra time. From 1927-28 his senior appearances became less frequent but he still turned out for the reserves on a regular basis. On leaving Macclesfield Chester moved to Witton Albion. Returned to Macclesfield towards the end of November 1946 for two months as coach following the resignation of Jos Stevenson, manager, and prior to the appointment of William Edwards as player/manager. As indicated before, away from football he was a keen cricketer and from the age of 16 was a member of the first eleven for Macclesfield where he was their wicket keeper. He also played for the Cheshire County team. He was well known in the town running a tobacconists in Market Place in the small black and white timber framed building which has also been a jewellers. Died in Macclesfield in 1968. As a youth he played for Audley FC and Sandbach Ramblers but sustained a broken leg which kept him out of contention for a considerable time. He joined Stoke's wartime team in 1915 playing for them once in 1915-16, six times in 1916-17, 37 times in 1917-18 and 26 times in 1918-19. Once League football resumed in 1919 he was the first choice full-back for Stoke and made 34 appearances in all competitions in the 1919-20 season but only played three matches in 1920-21 when he lost his place to Tom Brittleton. Having been released at the end of the season, he moved to Port Vale where he appeared regularly in the 1921-22 season until he sustained a cartilage injury, but after he had recovered from an operation he only made four further senior appearances and was released at the end of the 1922-23 season. Signed for Macclesfield in the summer of 1923, appeared in three early season in place of the regular left-back Harry Pearson and played alongside his brother, Chester, in two of these matches. On leaving Macclesfield signed for Oswestry Town in the summer of 1924..
A bricklayer by trade, Billy bred Irish terriers as a hobby. Died on 1 June 1933 in Hanley. Twigg's two appearances came on his debut and on the final day of the 1923-24 season when Macclesfield had to play two matches on the same day in order to complete their league commitments and was brought into the team when he was probably a member of the King School Old Boys' football team. Having spent 19 years in the army, Lieutenant Twigg was commissioned in 1945. He had been educated at St George's and King's Schools and before joining the army worked at J Arnold and Co Ltd, silk manufacturers. Gary spent four years with Manchester United from the age of 14 before joining Darlington in 1996 where he made his League debut. He then had one year spells at Gateshead, Grantham and Hednesford Town, but wanting to move back into League football, he was given a trial with the Silkmen in the summer of 2000 when he impressed Peter Davenport with his forward runs and was given a one-year contract. However, Gary only managed a handful of first team appearances in midfield when glimpses of his talents were seen, often beating several opposing players with powerful runs, clean tackling and good distribution. Unfortunately, illness and injury kept him out of contention and his contract was cancelled by mutual consent in February 2001. He subsequently returned to the non-League scene with Halesowen Town and later with Welsh clubs Haverfordwest, Port Talbot and Barry Town for the 2003-04 season after which it is thought that he retired from playing football.